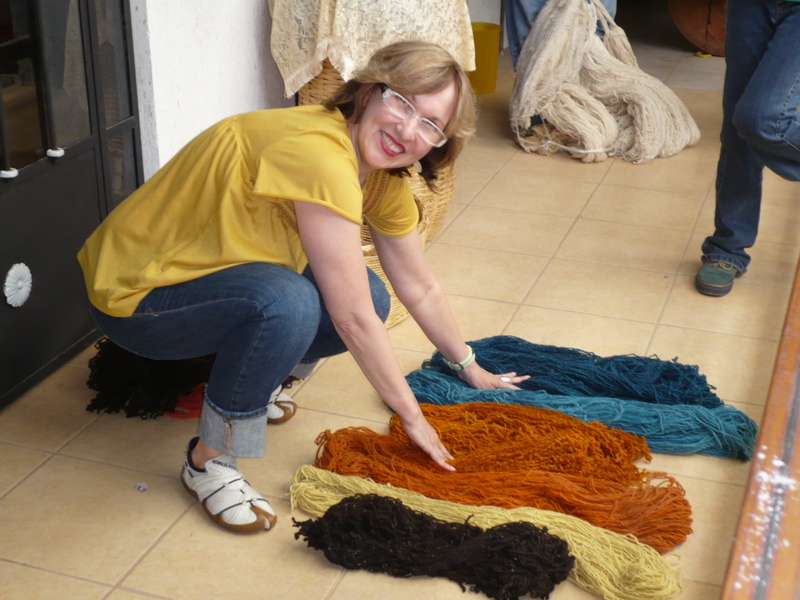 Karen Karuza arrived this morning to begin a four-day weaving and natural dyeing workshop with the Chavez Santiago Family, Francisco I. Madero #55, Teotitlan del Valle at their studio and gallery. Karen is an artist and has been teaching textile design at the Art Institute of Philadelphia for 20 years. Her son, Sebastian, age 14, who was born in Oaxaca, accompanied her. It was perfect because he could hang out with Omar Chavez Santiago, also age 14. 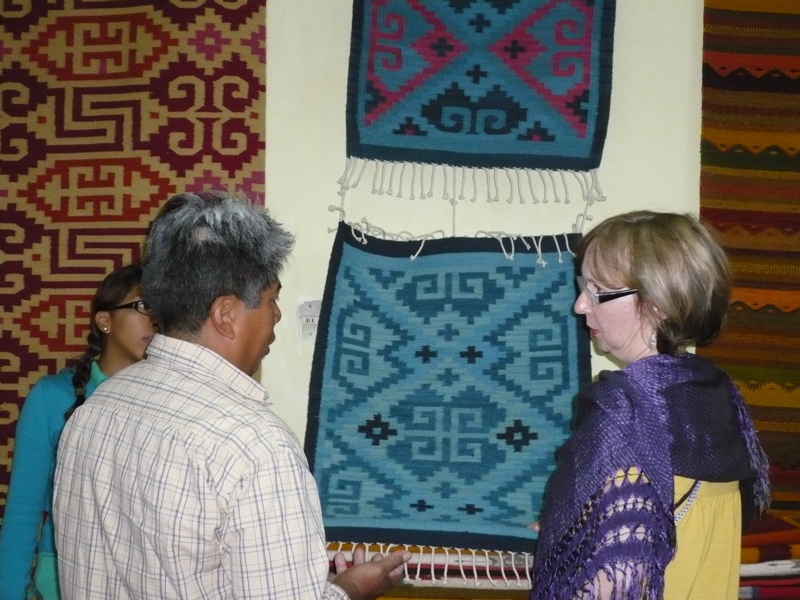 Karen is not an experienced weaver, but took to the process instantly with expert guidance from master weaver Federico Chavez Sosa. 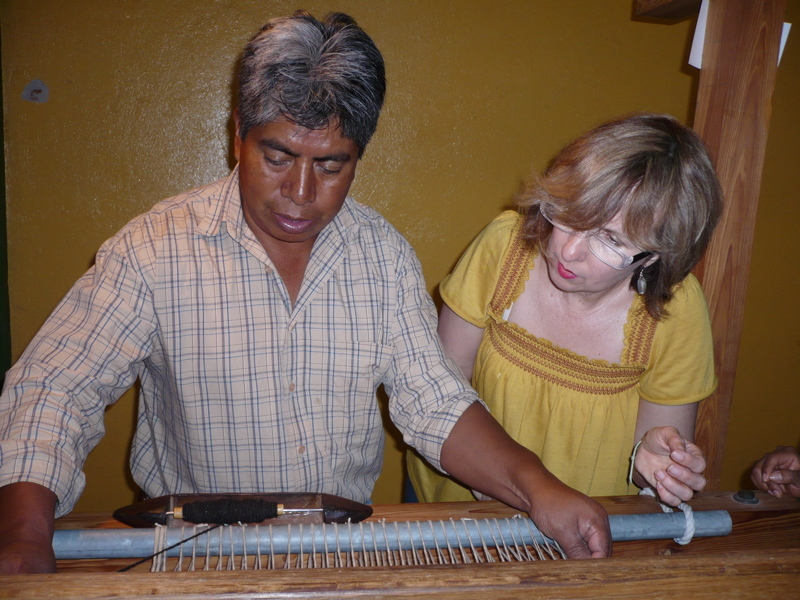 Federico and his daughter Janet Chavez Santiago first explained to Karen how the Zapotec loom is used and how it was warped. 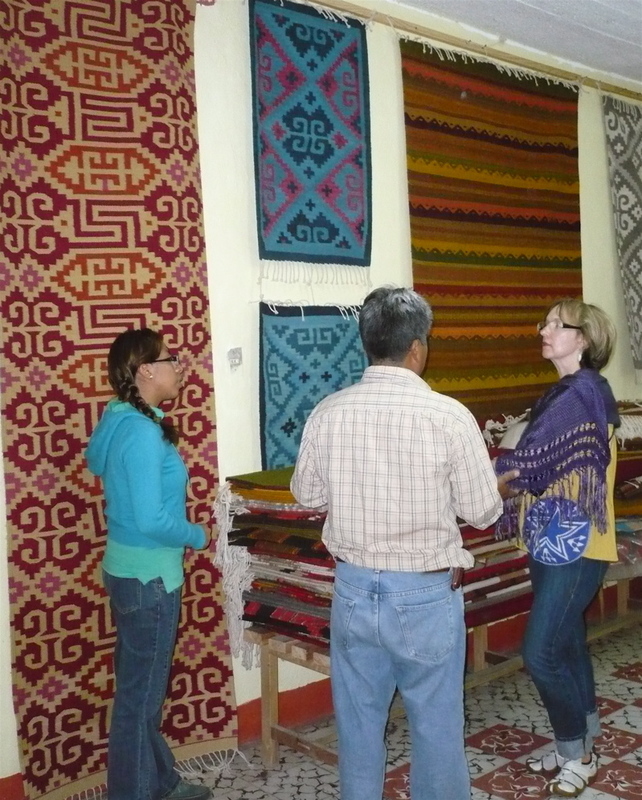 Then, they all went into the rug gallery where Federico and Janet pulled out many rugs woven with natural colors so Karen could see the choices of color combinations and patterns that she might use in the piece she planned to weave. 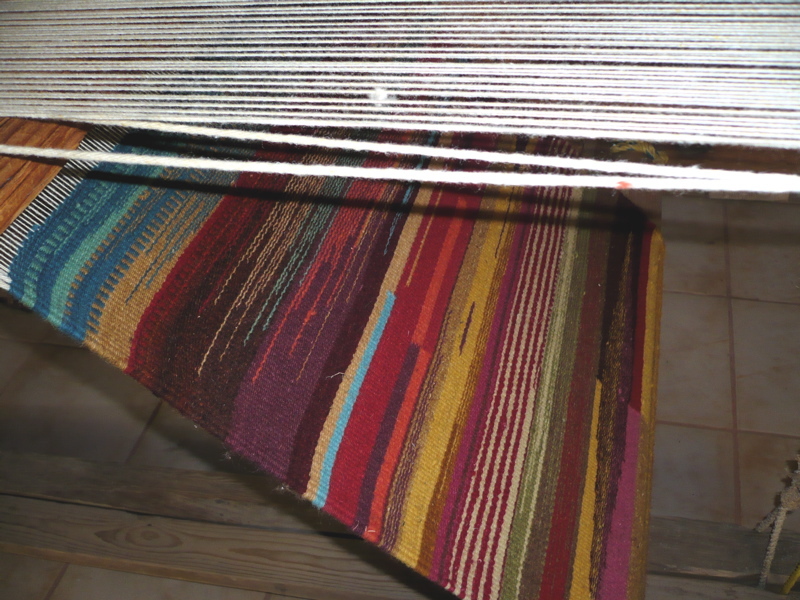 Here, she could see the finished pieces woven by Federico, his wife Dolores, Janet, and sons Eric (age 24) and Omar. 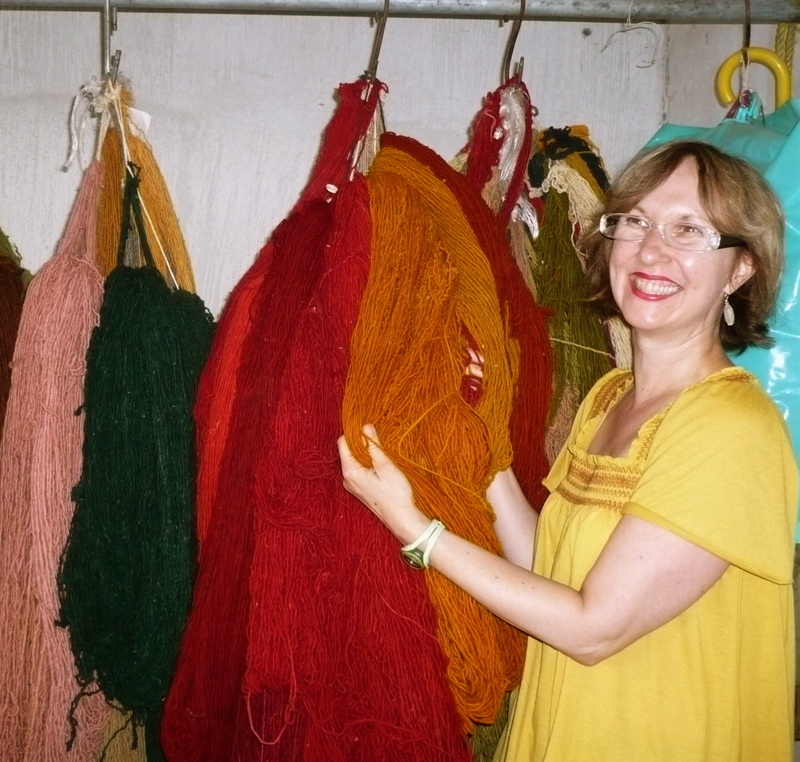 Next, Federico and Janet took Karen upstairs to the area where the dyed wool is stored. Here, she could choose the colors she preferred. 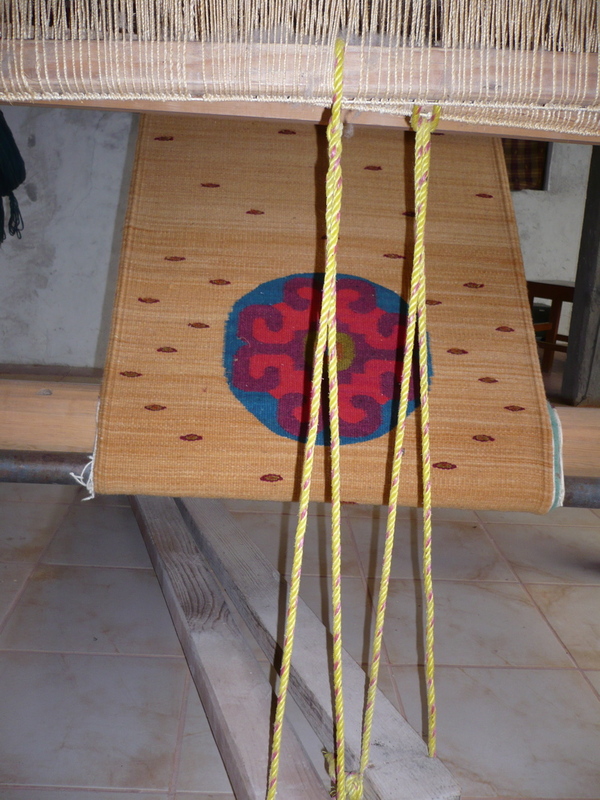 Then, they went back downstairs to the weaving workshop area where Federico showed Karen how to wind bobbins using the spinning wheel. 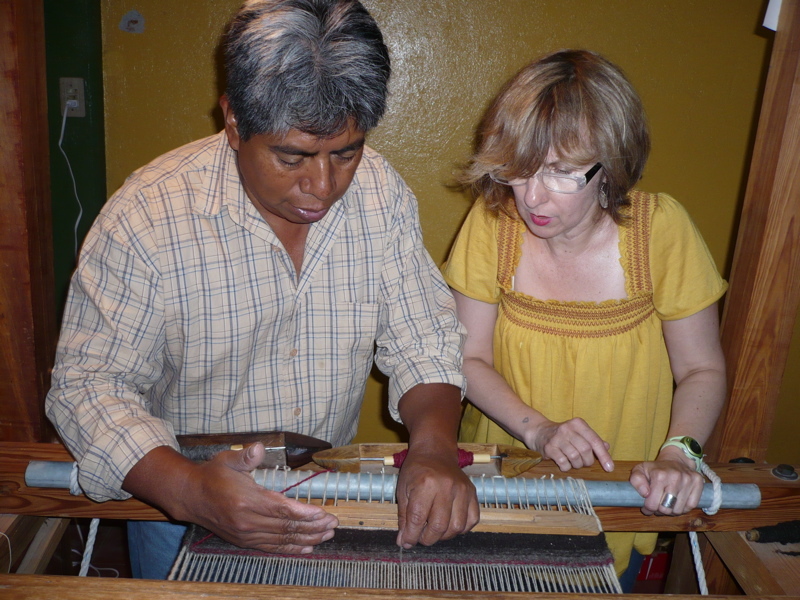 With Karen at the loom next to him, Federico then demonstrated the tapestry weaving techniques of Teotitlan del Valle, how to put the shuttle through the loom, use the foot pedals, and manipulate the yarn to achieve an even border. 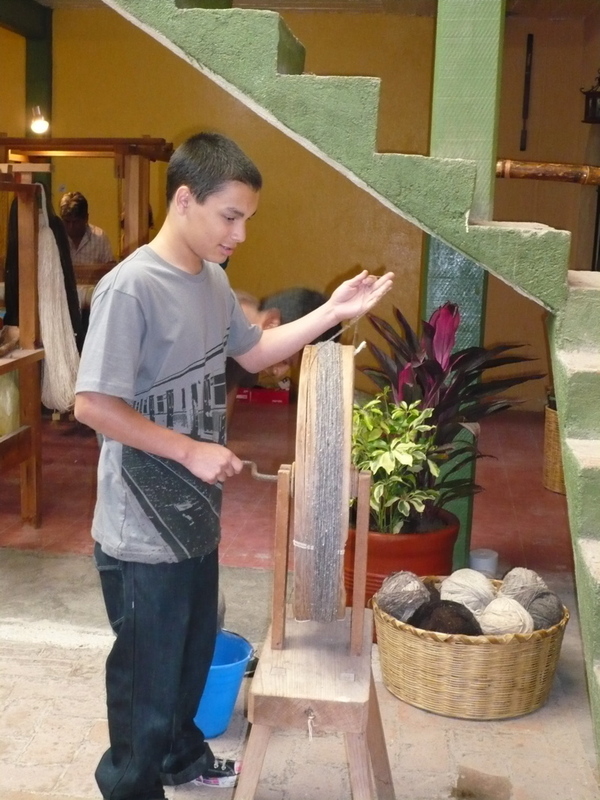 The two fourteen year olds, Omar and Sebastian, worked together to spin the wool onto bobbins that would be put into the shuttle. 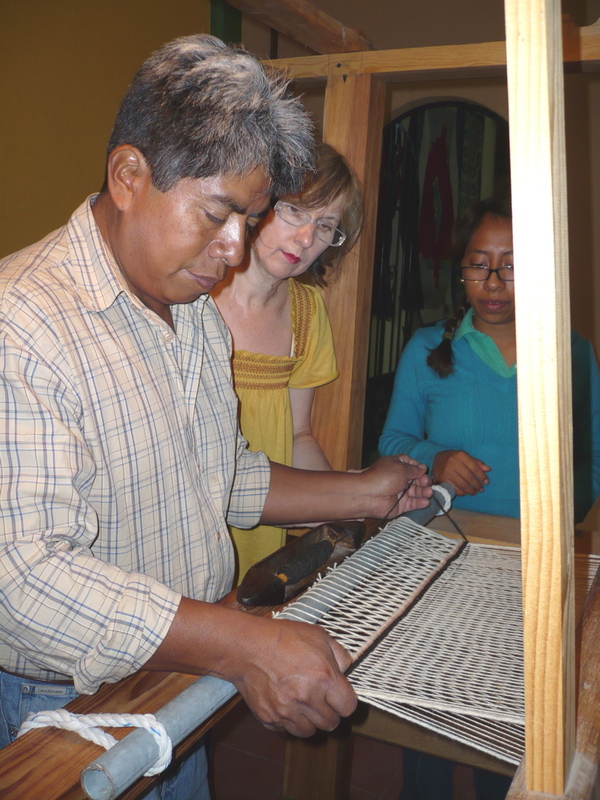 As the family gathers around the loom, Federico teaches and coaches, Janet translates as necessary, and both father-daughter team encourage Karen as she begins the rhythm of weaving. 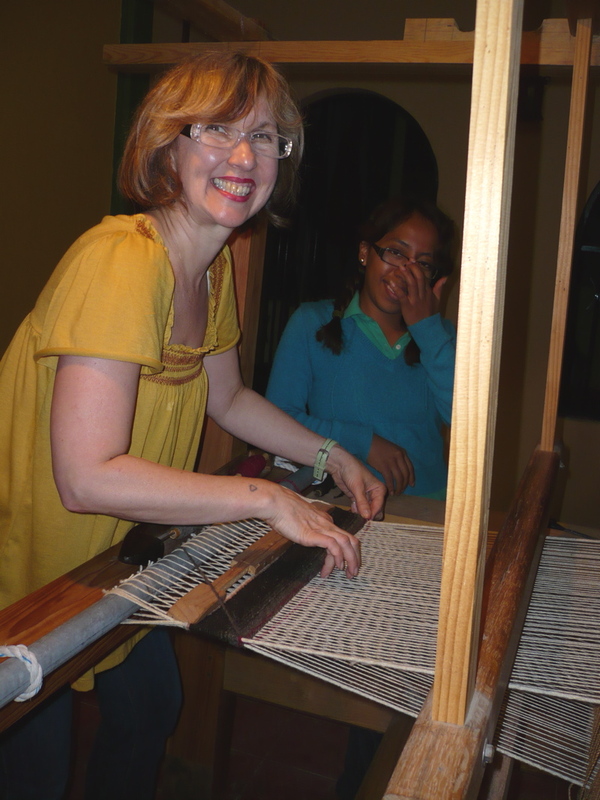 Janet says, “When you have the idea how the loom works, it is easier to do it. It just takes practice.” Karen is learning quickly and after only a few hours, has created the beginning of a beautiful tapestry that she intends to use as a wall hanging when she returns home. 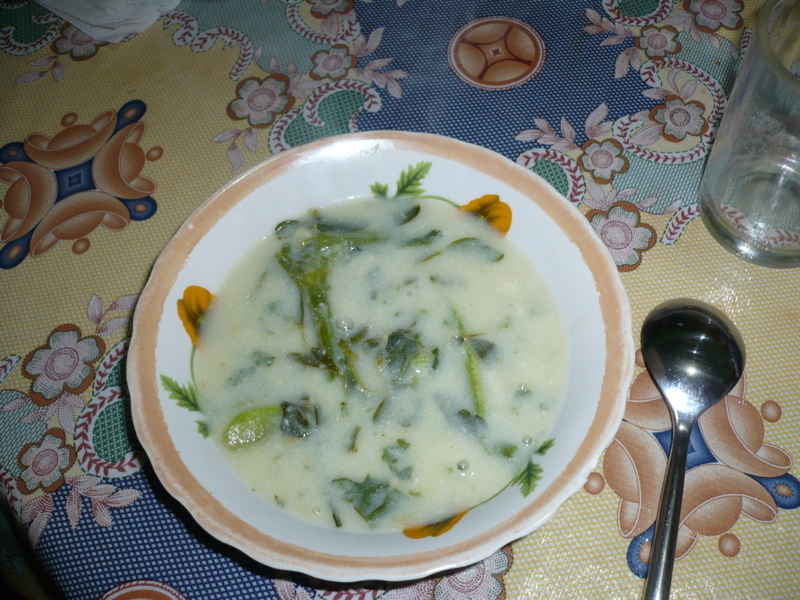 After the 9 a.m. to 2:30 p.m. period of instruction is over, Karen, along with her son, gathered around the family table for comida — the mid-day meal — that included homemade sopa de elote con flor de calabassas and tasajo con queso, salsa y tortillas prepared by Dolores Chavez Arrellenas who is an extraordinary cook. Now, to get ready for tomorrow’s lesson, Omar is squeezing 100 limes by hand. 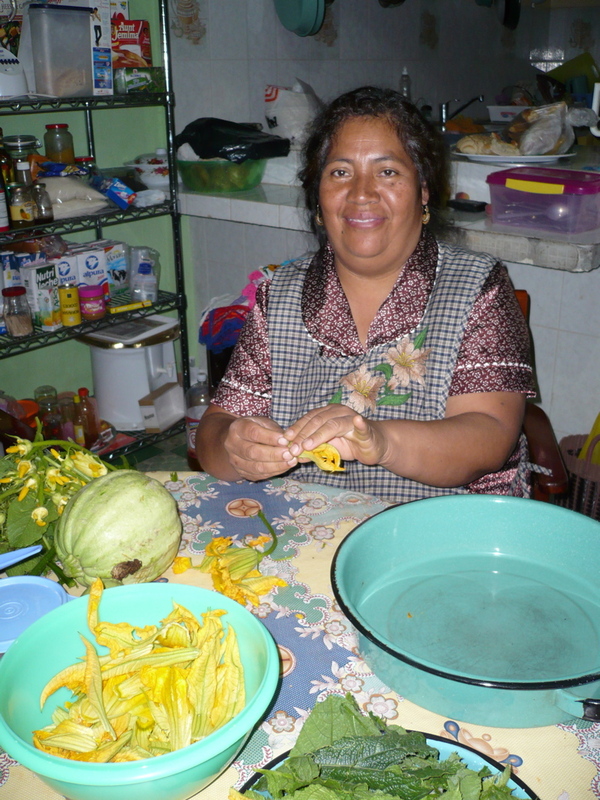 The juice will be used to prepare the cochineal for the dyeing portion of the workshop. 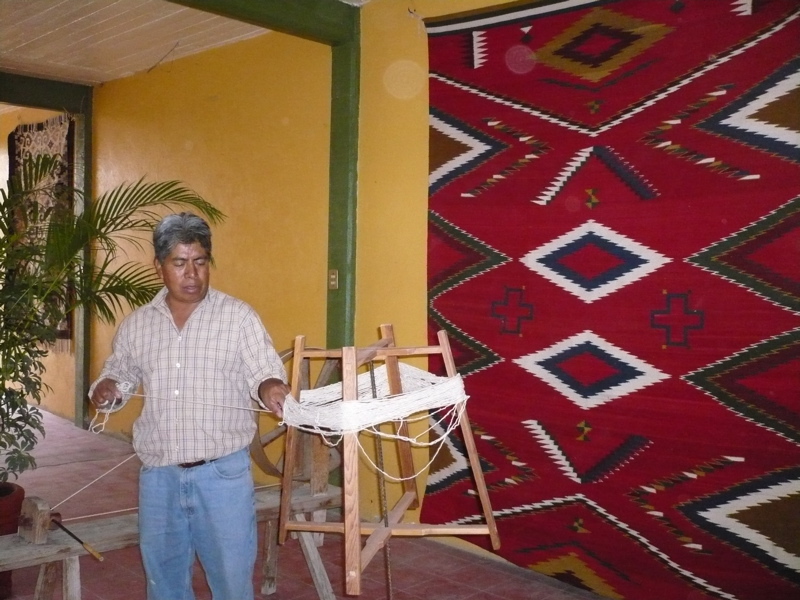 Note: The workshops are held in the taller — home and studio — of Federico Chavez Sosa and his wife Dolores Santiago Arrellanos, in the village of Teotitlan del Valle, about 17 miles outside Oaxaca city. The gallery and studio is open daily, however, it is always wise to call ahead to make certain that someone is home! The phone number is (951) 52 44078. Add 011 52 if calling from the U.S. This entry was posted in Cultural Commentary, Food & Recipes, Oaxaca Mexico art and culture, Oaxaca rug weaving and natural dyes, Oaxaca travel, Teotitlan del Valle, Travel & Tourism and tagged Chavez Santiago Family weavers, cochineal dye, Eric Chavez Santiago, Federico Chavez Sosa, flor de calabasas, learn to weave Teotitlan del Valle, Mexican rug patterns, Oaxaca rug weaving and natural dyes, Oaxaca weaving workshop, Sopa de Elote. Bookmark the permalink. im glad i found you. i tought weaving for the city of wichita, kansas for many years and before i retired i had 6 employes and sold clothing i designed from our handwoven fabric. ill be in oaxaca next week so will look up the museo.